For years, I have considered Fairways of Woodside to be my “home course.” I have introduced probably 30 or more golfers to Fairways of Woodside for their first time since the course opened about ten years ago, and the first thing every one of them mentions is the stark contrast between the front and back nines. The front nine is short (3,031 yards from the tips), with long par threes (229, 204). The back nine, on the other hand, is a whole different animal. While the par threes are more easily managed (149, 166), there are long carries and a plethora of tight fairways that are considerably more difficult to hit. At 3,504 yards from the tips, it is much longer and more difficult than the front. The front nine starts out with a short par four: 295 yards from the tips. Two of the closest tee shots I have had in my life to being holes-in-one have been on this hole – both tap-ins from the opposite side of the hole (both times playing from the 269-yard white tees, I will admit). It is definitely a feel-good hole to get started out on. The second hole does not look tremendously difficult on the scorecard, at only 349 yards, but takes great precision on the approach shot to a green that is highly elevated, guarded in front by sand, and slopes significantly from the front-right to the back. Most approach shots hit by anything more than a wedge will not hold the green. The elevated green drops into the woods to the left and back. The third hole is one of the hardest on the front nine: A long par three with water on the left, a large sand trap on the right side (and homes further right), and a strong slope toward the water. A long iron or wood is necessary here for even the longest hitters. The fourth and fifth each present a lot of options for big draw hitters. Both are short (349 and 338 yards, respectively) par fours that dogleg left, and I have seen draws hit both greens. Of course, the smart play is anything less than a driver on both, which should leave a pitching wedge or less to the green. 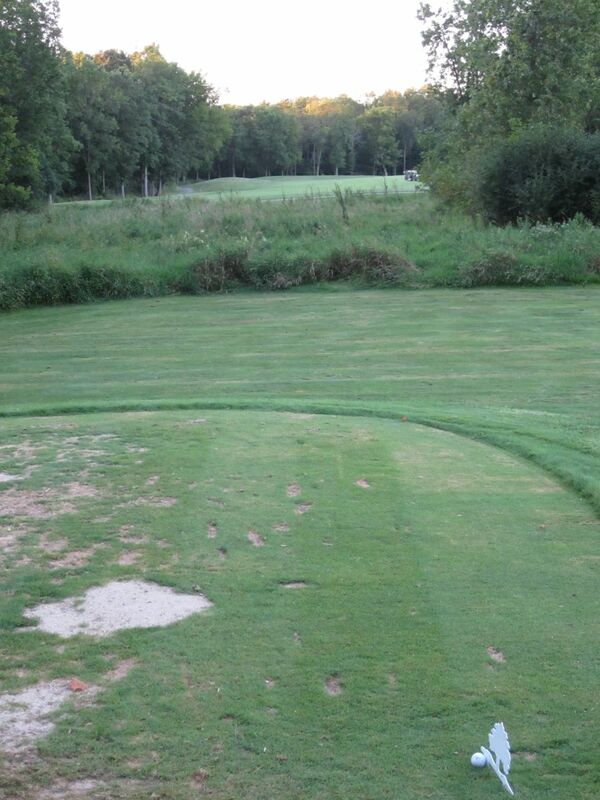 The sixth hole is probably my favorite hole in the history of golfing to drive on. 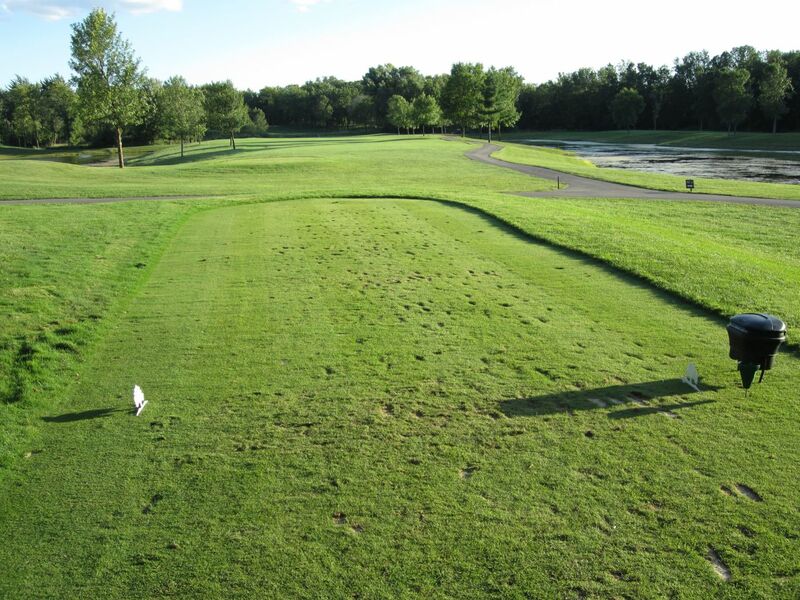 While the tee shot is blind, aiming over the green conductor to the left of the fairway presents you with a short-cut to the fairway, and potentially to the green. The distance here is measured down the fairway, which makes 391 or 372 yards seem pretty far, but a hugely hit drive over this electrical box can lead you to the lower part of the fairway, and potentially close to the green. I got to my ball yesterday, for example, and had a four-yard chip to the green, which was a pretty awesome surprise. Seven is a tough hole, and I think because it is so easy to over-think the tee shot. Throughout the years, I have probably sliced as many balls in to the woods on the right side of the fairway than I am able to count in one setting, and I feel pretty good about my ability to count. A long iron or wood can set you up for an easier approach shot, as long as you can keep your tee shot straight. The ninth is the only par five on the front nine, and it’s a good one. At 553 yards from the tips, it requires a straight and long enough drive that you can see the fairway as it meanders to the right, and a setup shot that will allow you a good approach to a small, narrow green. I have always enjoyed this hole, and it is a good warm-up for the length that is required on the back nine. 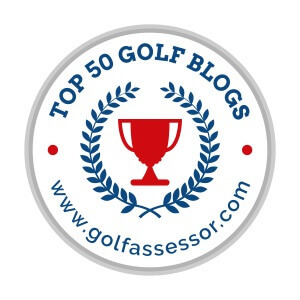 Hopefully you scored well on the front, because for most golfers the back is all about survival! The tee shot on the tenth is best played to the left – put your drive out there far, and you will have a shot to the green. I always play to the left, to take the water out of the equation entirely. The tenth has probably my favorite water feature on the course, which they did a fantastic job of remodeling last season. It doesn’t hit you until you’re on the green that this hole, at 404 yards, is longer than any of the par fours on the front nine. It is the second shortest par four on the back nine, though. Like I said, the back is a totally different animal. For me, the hardest hole on the course is the par five 13th. There are large ponds that run along the first length of the fairway on both sides of the 13th hole, and this tee shot seems to get in my head 90 percent of the time. Take whatever club you can keep straight and hit under 225 yards, and bang it out there. Do that, and you should have an excellent chance for birdie. Don’t do that, and you will be dropping three and either laying up in front of the wetlands area, or else hitting a side lie over 150-plus yards of wetland area to the landing zone that leads uphill to the green. This hole plays much longer than 479! 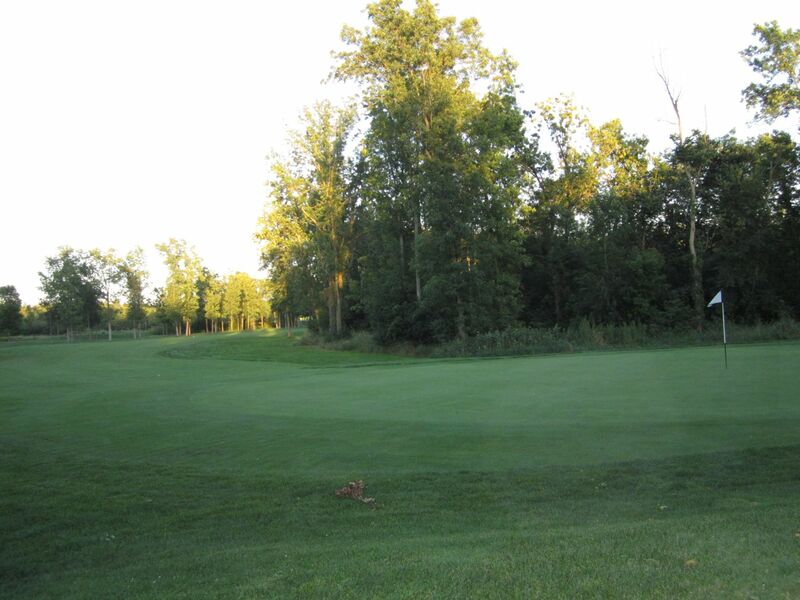 Fourteen is only eight yards shorter (467 yards from the tips) than the 13th, and features a 220-yard carry over wetlands to a narrow fairway that is hedged by woods on the left side. The right side is mounded, and the approach is always long and can only be bailed out to the right. Anything to the left will not be found. When the course was first revealed, I remember reading an article that named the fifteenth the hardest par five in Waukesha County. I do not disagree with this statement one bit. 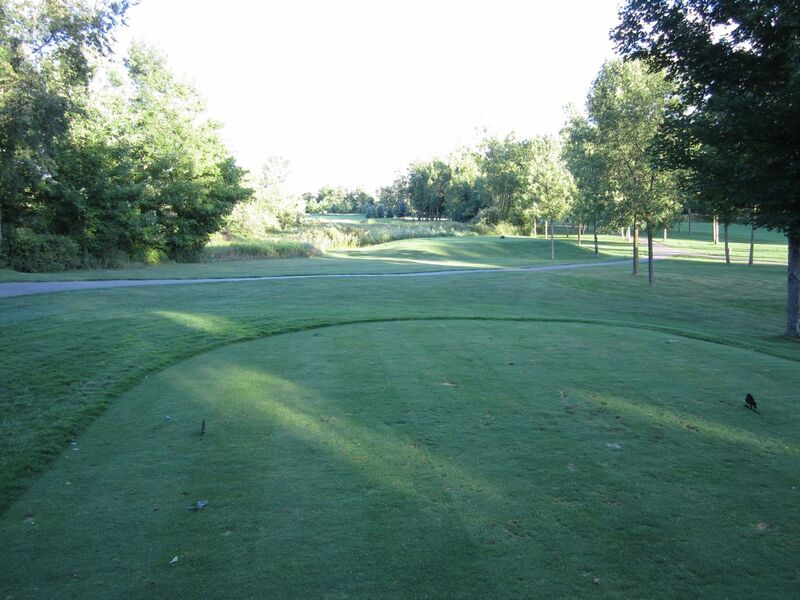 At 573 yards from the black tees, the tee shot needs to be farther than the trees on the right, longer than the pond on the left side of the approach, and short of the woods that the fairway carves between. The second shot then needs to be long enough to outflank the woods on the left, and the third then comes straight back left for another 150 yards. This double-dogleg requires two great shots, at the very least, for any chance of par. A friend of mine once got a two on this hole (albatross, or double-eagle? ), but it has always remained debatable as it seems like it should A) be impossible, and B) his drawn three-wood over the trees in to the hole (from 250-plus yards out) could not actually be seen. It was phenomenal, nonetheless, and was certainly heading in the right directon. I like to think if there was a group in front of us, that they did not move his ball in to the cup. Looking at the second image below, captured from Yahoo! Maps, you can see the approximate location of the drive, as well as that day’s hole location. This had to be one of the most miraculous shots in the history of golf. The seventeenth is the fifth handicapped hole on the course, which I think is understated. With a lot of water on the right side, the approach is always long, and has to be absolutely precise in between the trees that are beyond the tiny green, the sand traps in front of it, and the water in front of those. 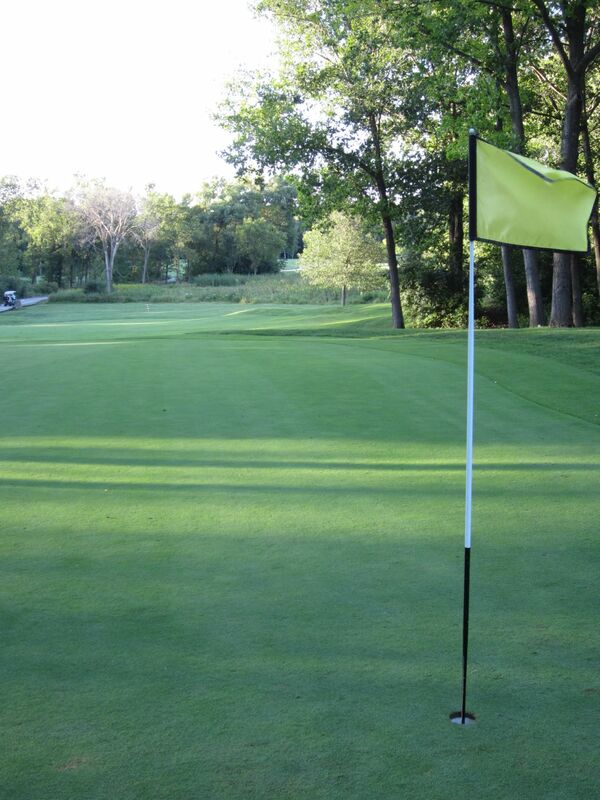 Just as Fairways of Woodside starts out with a feel-good par four, it ends with one, too. At 303 yards from the white tees, the green is [somewhat] drivable. The black tees are another 80 yards further back, though, which requires a bit more skill, but still two shots to a large, and multilayered green. 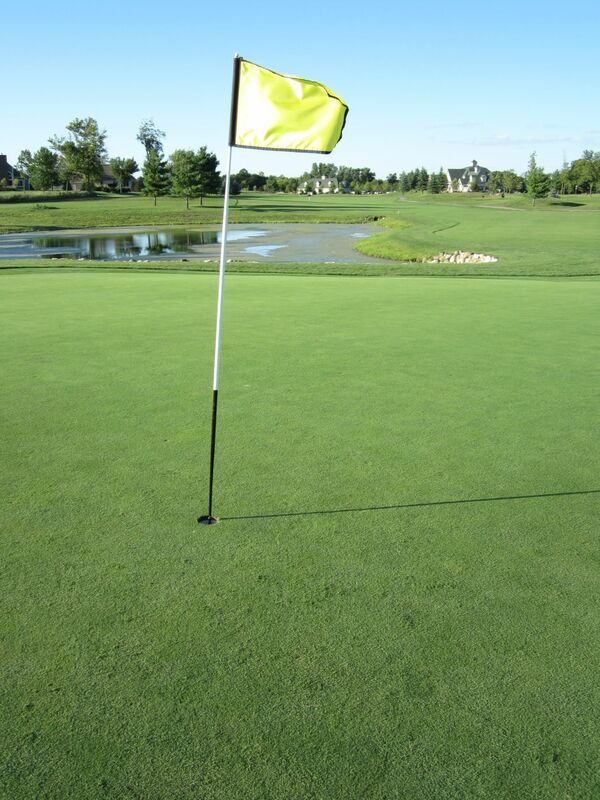 Make sure to take note of the pin position before hitting your approach shot on this green, as a shot to the back will require at least one more club than a forward pin position. Fairways of Woodside is the kind of course you can play over and over again, and not get tired of it. It is a fantastic value, and has a truly wonderful staff, clubhouse and overall essence.